Gavrila Romanovich Derzhavin (Russian: Гаврии́л (Гаври́ла) Рома́нович Держа́вин; IPA: [ɡɐˈvrilə rɐˈmanəvʲɪtɕ dʲɪrˈʐavʲɪn]; July 14, 1743 – July 20, 1816) was one of the most highly esteemed Russian poets before Alexander Pushkin, as well as a statesman. Although his works are traditionally considered literary classicism, his best verse is rich with antitheses and conflicting sounds in a way reminiscent of John Donne and other metaphysical poets. Derzhavin was born in Kazan. His distant ancestor Morza Bagrim, who relocated from the Great Horde in the 15th century to Moscow, was baptized and became a vassal of the Russian Grand Prince Vasily II. Morza Bagrim was a Tatar. Nevertheless, by the 18th century Derzhavin's father was just a poor country squire who died when Gavrila was still young. He received a little formal education at the gymnasium there but left for Petersburg as a private in the guards. There he rose from the ranks as a common soldier to the highest offices of state under Catherine the Great. 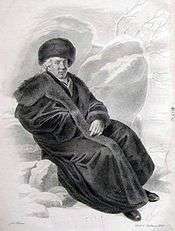 He first impressed his commanders during Pugachev's Rebellion. Politically astute, his career advanced when he left the military service for civil service. He rose to the position of governor of Olonets (1784) and Tambov (1785), personal secretary to the Empress (1791), President of the College of Commerce (1794), and finally the Minister of Justice (1802). He was dismissed from his post in 1803 and spent much of the rest of his life in the country estate at Zvanka near Novgorod, writing idylls and anacreontic verse. At his Saint Petersburg house, he held monthly meetings of the conservative Lovers of the Russian Word society. He died in 1816 and was buried in the Khutyn Monastery near Zvanka, reburied by the Soviets in the Novgorod Kremlin, and then reinterred at Khutyn. Derzhavin is best remembered for his odes, dedicated to the Empress and other courtiers. He paid little attention to the prevailing system of genres, and many a time would fill an ode with elegiac, humorous, or satiric contents. In his grand ode to the Empress, for instance, he mentions searching for fleas in his wife's hair and compares his own poetry with lemonade. Unlike other Classicist poets, Derzhavin found delight in carefully chosen details, such as a colour of wallpaper in his bedroom or a poetic inventory of his daily meal. He believed that French was a language of harmony but that Russian was a language of conflict. Although he relished harmonious alliterations, sometimes he deliberately instrumented his verse with cacophonous effect. Derzhavin's major odes were the impeccable "On the Death of Prince Meschersky" (1779); the playful "Ode to Felica" (1782); the lofty "God" (1785), which was translated into many European languages; "Waterfall" (1794), occasioned by the death of Prince Potemkin; and "Bullfinch" (1800), a poignant elegy on the death of his friend Suvorov. He also provided lyrics for the first Russian national anthem, Let the thunder of victory sound! 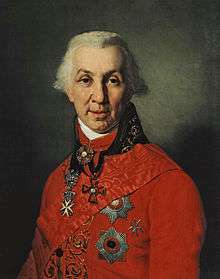 In 1800, Derzhavin wrote the political work Opinion, an anti-Semitic tract in response to a request by Emperor Paul I to investigate recent famines in Belorussia. In the Opinion, Derzhavin blamed Belorussian famines on the "mercenary trades" of Jews, who exploited peasants through leaseholding of estates and distilling of alcohol, as well as the indifference of the local magnates who allowed this exploitation to occur. In response to these issues, Derzhavin proposed a series of reforms to substantially restrict the freedoms of the magnates, abolish the Jewish Qahal, end the autonomy of the Russian Jewish community, and resettle Russian Jews in colonies along the Black Sea. The Opinion became an influential source of information during the early reign of Alexander I, who eventually implemented several of Derzhavin's suggested reforms in the 1804 Statute Concerning the Organization of the Jews. According to D.S. Mirsky, "Derzhavin's poetry is a universe of amazing richness; its only drawback was that the great poet was of no use either as a master or as an example. He did nothing to raise the level of literary taste or to improve the literary language, and as for his poetical flights, it was obviously impossible to follow him into those giddy spheres." Nevertheless, Nikolai Nekrasov professed to follow Derzhavin rather than Pushkin, and Derzhavin's line of broken rhythms was continued by Marina Tsvetaeva in the 20th century. 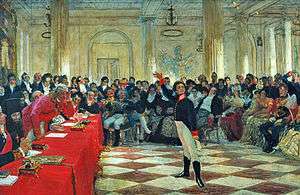 16-year-old Pushkin reciting his poem before old Derzhavin in the Tsarskoye Selo Lyceum (1911 painting by Ilya Repin). ↑ Daniel Rancour-Laferriere (2000). Russian Nationalism from an Interdisciplinary Perspective: Imagining Russia. E. Mellen Press. p. 90. ISBN 978-0-7734-7671-4. ↑ Klier, John (1986). Russia Gathers Her Jews: The Origins of the "Jewish Question" in Russia, 1772-1825. Dekalb, Illinois: Northern Illinois University Press. pp. 95–115. ↑ D.S. Mirsky. A History of Russian Literature. Northwestern University Press, 1999. ISBN 0-8101-1679-0. Page 53. His memoir Zapiski has been reprinted by Oriental Research Partners (Newtonville, MA) in 1973 with a new introduction by Prof. Richard Wortman, University of Chicago.